Latin America books - 7th grader reviews, part 2: Central and South America. My students share their book review posters featuring a short summary and a portrait of the "ideal reader." New Book Alert: Real Friends. Great new addition to the graphic memoir format! #DiverseKidLit Chat Transcript. Check out all the amazing answers and comments from our recent Twitter chat! 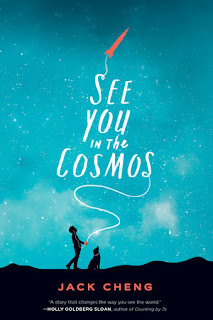 See You in the Cosmos (2017) by Jack Cheng. 11-year old Alex dreams of sending a rocket into space and including his iPod recordings (a la Voyager and its golden record). He heads off to a rocket launching event, kicking off the road trip at the heart of the book. If you can get past over-thinking the narrative structure (a boy recording into his iPod), this is a charming and heart-wrenching book about following your dreams, the kindness of strangers, and the impact of mental illness on families. Highly Illogical Behavior (2016) by John Corey Whaley. This story in two-voices alternates between the perspectives of Solomon, an 11th grade agoraphobic who hasn't left his house in over three years, and Lisa, the girl determined to "save" him in order to write a stellar college application essay. Despite that able-ist premise, the book actually has more thought and nuance to it than I was expecting. I would, however, be curious about the author's authority and experience regarding agoraphobia and mental illness. 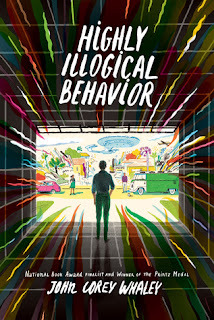 I enjoyed Highly Illogical Behaviour, but I am a fan of ohn Corey Whaley's work. It's always thoughtful and slightly mind bending. This was the first book of his that I've read. I'll have to check out the others! I was staggered by Where Things Come Back, so I am really, really excited for Highly Illogical Behavior. Cool. I'll have to check that one out too! I realized just now how Highly Illogical Behavior would have been perfect for our previous reading theme. Thank you for sharing these two titles - they do look like good companion texts.